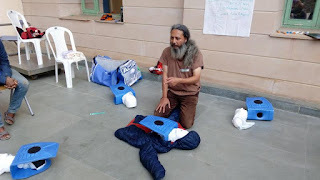 WILDERNESS FIRST AID COURSE - WFA was organized in Hyderabad on the 2-3-4 Dec by CELOL ( Centre for Experiential Learning and Outdoor Leadership) and GHAC in partnership with Hanifl Centre and AERIE Backcountry Medicine, USA. This course comprised of a 16-hour (WFA) module and a 4-hour Cardio Pulmonary Resuscitation (CPR) module and is accredited by Wilderness Medicine Society (WMS) and American Heart Association (AHA). The Wilderness First Aid certification is a mandatory qualification for anyone leading, organizing and facilitating activities in the outdoors. 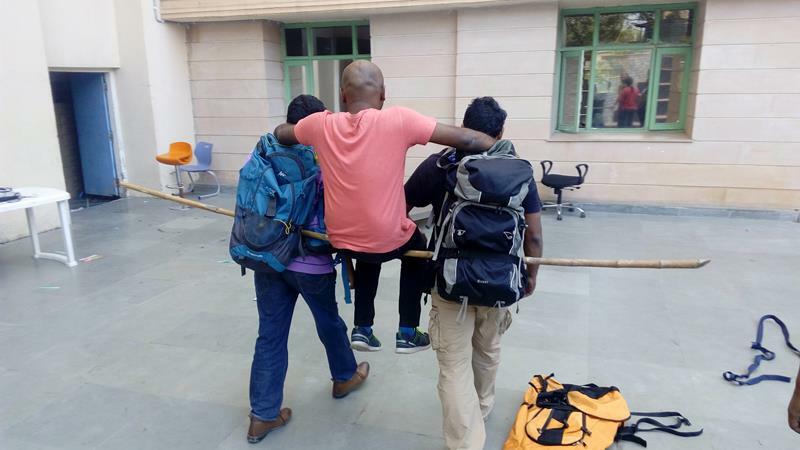 The 2& ½ Day Wilderness First Aid program was held at Oakridge International School, Gachibowli on the 2-3-4 December and was attended by 25 professionals and enthusiasts from the outdoors, adventure, travel and fitness communities . The workshop included a 20 Hour Curriculum integrating classroom instruction with scenario based learning and included the following. Participants were given certificates after passing an evaluation demonstrating their confidence and competence in doing patient assessment in different scenarios and providing appropriate first aid as per the scope of the WFA course. The course also focused on making improvisations in remote environments including lifting and evacuation techniques in the wilderness areas to reach out to the nearest medical care facility. CELOL (Centre for Experiential Learning and Outdoor Leadership) www.celol.org is a Hyderabad based initiative by Diyanat Ali, Founder Great Hyderabad Adventure Club to promote experiential learning and outdoor leadership to build a community of professionals. CELOL focuses on sharing best practices, mentor and coach aspiring trainers and leaders so that they will learn both theoretical and practical approaches for experiential and outdoor education. The Hanifl Centre for Outdoor Education and Environmental Study was initially built to extend Woodstock Schools curriculum and to provide a facility and a programme through which students can learn about the Himalaya and develop their skills and knowledge in outdoor education. AERIE BACKCOUNTRY MEDICINE: Based in Missoula, Montana, Aerie provides wilderness and rural medical training and first aid supplies to over 2,000 students a year throughout the United States, Mexico, Central America, Africa and India. Aerie is operating for 20 years with over 10,000 graduates. Aerie is unique in the wilderness medicine training world - small enough to focus on individual students and large enough to be involved in all levels of the outdoor industry and its training needs.